For Gavin Whitridge, Duke of Baynton, the journey to love has not been an easy one. He lost his first potential bride to his youngest brother, Ben (The Match of the Century). True, Baynton had been betrothed to Elin Morris since they were children, had never paid much attention to her until he decided he was ready to marry, probably held deeper feelings for her father (his financial mentor after he inherited a debt-ridden estate from his own father) than he did for Elin, and Elin and Ben were deeply in love, but still... For his second attempt at marriage, he handed the reins to his mother and aunt who chose a lovely young woman with no money but the proper bloodlines (The Fairest of Them All). Too bad Lady Charlene had already fallen for Baynton's long lost twin brother who returned to the family fold the very night Baynton and Charlene were introduced. 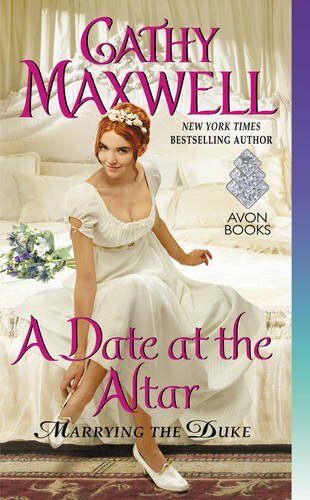 In Maxwell's newest book, A Date at the Altar, Baynton finally finds true love and it is well worth the wait. I've been reading Cathy Maxwell's books for a number of years and have enjoyed many characters along the way but the Duke of Baynton and Sarah Pettijohn have evolved into two of my favorites. I couldn't have said that about Baynton at the beginning of the trilogy. He was a product of his upbringing: arrogant, inflexible, self-centered, and manipulative. There were flashes of a kinder, less selfish man but it isn't until his journey with Sarah in A Date at the Altar that he finally matures into a man worthy of his heroine's heart...and mine. Maxwell skillfully guides him through all obstacles along the way, allowing him to evolve organically, at a gradual pace, until, finally, his heart and mind are opened to what is most important in his life, in a sigh-worthy conclusion that I can't seem to stop re-reading. And, without giving anything away, let me just say that I adored this book's epilogue, delightfully titled "And so..." It is exactly what I hoped their life would be! Sarah, on the other hand, is a character who intrigued me from the time of her introduction in The Fairest of Them All (she's the heroine's aunt) and I was so excited to discover she was destined to be Baynton's heroine. I admire her intelligence, her determination to be taken seriously as a playwright, her fight for justice when she and others are taken advantage of, and the courage she displays in light of her tumultuous personal history. She may not have the proper background to be a duchess but I can't imagine anyone more perfectly suited to be Baynton's partner in life. And, without giving anything away, let me just say that I adored this book's epilogue, delightfully titled "And so..." It was exactly what I hoped their life would be! 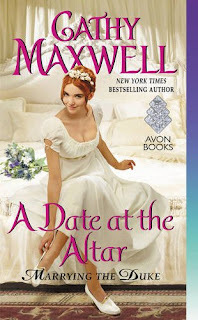 A Date at the Altar is a wonderful conclusion to an enjoyable trilogy. While this book does stand on its own, as stated above, Gavin/Baynton's journey plays out over the course of the three books which is why I strongly recommend reading them in order. Glad you suggest reading these in order. Some series are so "linked" that it's difficult to keep up if you don't read them in order. I think that's especially the case with this trilogy, Connie. I just started reading this. I am looking forward to Gavin finally getting the girl. I hope you love their story as much as I did, Cheryl! Just finished it. It was wonderful. Gavin and Sarah are a great couple. I've read the first two books in this series. Poor old Gavin. Let's hope that third time is a charm for him. :-) Thanks for my lovely book which arrived today. My kind of heroine. And I do so enjon Cathy's books. I really loved Sarah. She's a wonderful heroine! I need to start this triology - sounds wonderful. I enjoy Cathy Maxwell's books. I have not started this trilogy and it sounds like I will have to get all three and catch up on her writing.